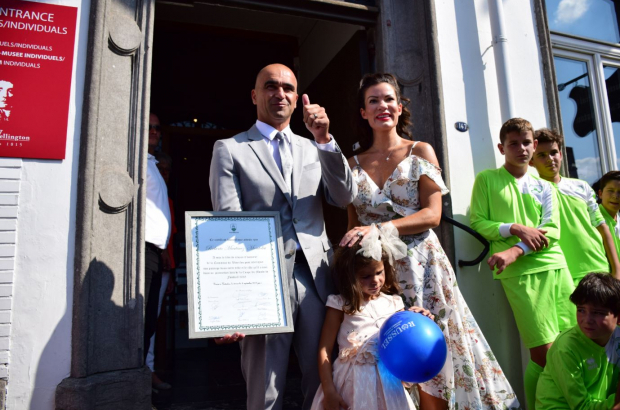 The Red Devils' head coach, Roberto Martinez, has been made an honorary citizen of Waterloo - and has thanked locals for their hospitality, adding that he has "ambitions to understand Belgium a little bit more". The Spaniard attended a ceremony organised by town officials on Sunday at the Wellington Museum, with his Scottish wife Beth and their daughter Luella. Waterloo mayor Florence Reuter led the proceedings, which were also attended by former Belgian footballer Georges Grün. "When we arrived in Belgium, Waterloo was recommended to us and we do not regret our choice," Martinez said. "It's a great place to live and all my family enjoy it. I love spending time here, the locals are hospitable and it's very multicultural so the language is not a barrier. " Reuter said: "We are very pleased to know that Mr Martinez appreciates the quality of life in Waterloo. It is an honour to count him among us and we wanted to tell him." Asked by RTL why he didn't speak any of Belgium's three official languages - French, Dutch and German - Martinez responded: "I think that my greatest strength since I have been a coach is that I am neutral, I understand the diversity and the difficulty we can experience because there are three official languages in Belgium. "Communication is essential in a cloakroom. I have to remain neutral for the good of the team but of course I have a lot of ambitions to understand Belgium a little bit more."